I would just like to report yet another Coyote Sighting in Beacon. 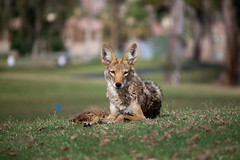 Early this morning, a friend and I spotted a Coyote at the intersection of College and 17th Ave at 2am on 11/6/11. This seems to be a growing trend. Folks should take precautions by leaving pets indoors and covering trash. Just thought everyone should know! My husband and I were out walking the dog around 5:30 pm at Maple Park. At the NW corner of the park on the other side of the fence we saw what looked like a dog, but taking a good look, we realized it was a coyote.